We are local locksmith company serving Allentown PA, and the entire Lehigh Valley, PA. Our mobile locksmiths drive to your location wherever you need us for help in the Valley. 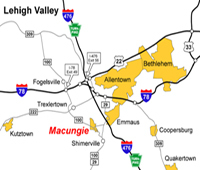 The complete area we serve is 30 miles around Allentown, Bethlehem, and Easton PA.
As we are working 24 hour a day. you can contact us at any time, day or night. Our locksmiths also cover the areas beyond the Lehigh Valley. That means, if you need emergency locksmith in Bangor PA or Quakertown PA, we can help you, too. It’s important to remember that when you have a security issue, whether you’ve lost your only automotive key, or you lock yourself out of your home, we can be on site within 20 minutes. In the same way, we carry wide inventory of security products and hardware. Mobile Locksmith In Lehigh Valley, PA.
We specialize in automotive, residential, and commercial locksmith services. When you lock yourself out of your or your house, we have the professional locksmith tools to get you back in, fast and safe. You can count on us when you need fast and reliable locksmith service. Don’t deal with your lock and key issues by yourself, in like manner, don’t let it ruin your day. When you loose your car keys or lock yourself out, please call us and we’ll be on the way to help. As for non-emergency locksmith services, we can re-key, repair and replace locks, install push-bars, security applications, and more. When you need a locksmith in the Lehigh Vaalley, PA, call our professional locksmiths in Allentown. As a full service mobile locksmith company, and as you’ve seen above, we provide all types of locksmith services covering residential, commercial and auto locksmith services in the Lehigh Valley area. Our team responds fast, no matter the time of day or night. We are licensed, bonded, and insured.